Cambridge English: Young Learners is a series of fun, motivating English language tests that gives a reliable and consistent measure of how well a child is doing in learning English. 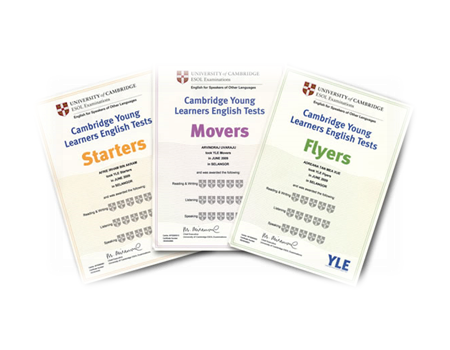 Cambridge English: Young Learners encourages younger children to work towards three certificates: Starters, Movers and Flyers. 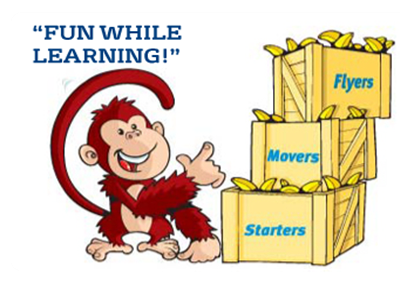 These tests are designed to make learning fun and children are motivated by working towards certificates and earning the ‘shields’ that record their progress. 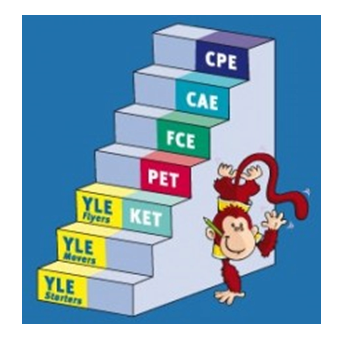 Cambridge English: Young Learners provides an appropriate first step towards other Cambridge English examinations designed for young people, e.g: Cambridge English: Key (KET) for Schools and Cambridge English: Preliminary (PET) for Schools. 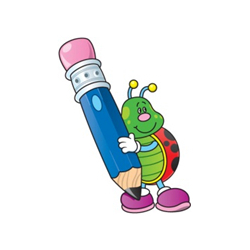 As the highest level test for the Young Learners, Flyers is said to be equivalent in language level to KET (Key English Test). It can serve as a bridge to KET or a step leading to PET (Preliminary English Test), as learners move into adolescence. Who is Cambridge English: Young Learners for? Cambridge English: Young Learners is designed to offer a comprehensive approach to testing the English of learners between the ages of 7 and 12. Good preparation for higher level Cambridge English exams.